Brands Hatch - I Say Ding Dong Shop - Buy Stickers, Decals & Unique Automobilia. Brands Hatch '1' Race of Champions Sticker. 4.75". Brands Hatch 'Motor Cycle Racing At' Sticker. 3.5". Brands Hatch 'The Motor' Saloon Car Race Sticker. 2.5". Brands Hatch 1967 Race of Champions Sticker. 4". 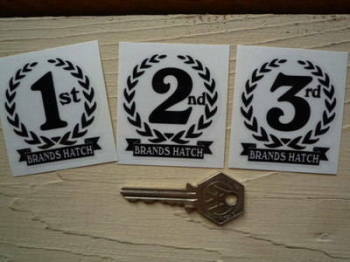 Brands Hatch 1st, 2nd & 3rd Podium Garland Stickers. 2". Brands Hatch Circuit Gulf Sticker. 4". Brands Hatch Daly Mail Race of Champions March 13 Sticker. 4.75". Brands Hatch Evening News International Race Banner Art. Special Offer to Clear. 22" x 27". Brands Hatch RAC A20 Sticker. 6" or 12". Brands Hatch Stock Car Racing Sticker. 4.5". 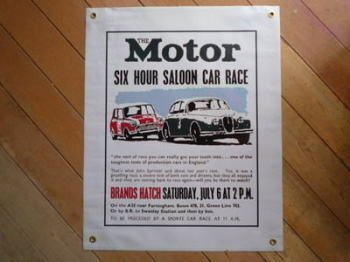 Brands Hatch The Motor Saloon Car Race Banner Art. 21" x 27". Brands Hatch. Grand Prix D'Europe 1964 Sticker. 3.5". British Grand Prix Shield & Scroll Sticker. 3". Champion British Grand Prix Brands Hatch Sticker. 6.5". Champion Race of Champions - Brands Hatch Sticker. 6.5".